I was coaching my Fluid Movements squad at the pool this morning, and an athlete’s question reminded me why it is important to have a tri coach who coaches you for all three disciplines, being swim, bike and run. The athlete asked can we use fins (speed assisted) for the final set of 4 x 25m f/s sprints?! In response I said no, as I knew what the athletes had done the night before, a strong sustained run on a cross country course, which I coached them for at Fluid Movements squad training 12hours earlier. If I had of said yes, it’s likely with the extra resistance of the fins under load that some of the athletes would have cramped due to the fatigued state their calves were in from the run. It’s very important in a balanced triathlon training program to manage the weekly load over all sessions. Your coach in my view should have an awareness of the state of fatigue that you turn up to your session in, and program the session accordingly. Only a tri coach who coaches you for all disciplines would intimately know that. I have held this view and practised this for the last 20years as a coach, it was instilled into me when I was a coached and it still rings true today. For example – 10 x 400m at La.T on the track with a 200m recovery. A great way to ensure this happens is to take note of the pace you hold for the 3rd repetition of the set. This pace or interval time is likely to be the most attainable pace you can hold for the final 7reps of the set. Usually the 1st and to a lesser extent the 2nd rep where you are the freshest isn’t sustainable, but by the 3rd rep you are likely to have hit your hardest sustainable rhythm that you can hold for the rest if giving it your all. Challenge yourself by using a pace and striving to hit the mark every time. You will be amazed at how deep you can go into the set whilst still hitting the mark. As our swimmers move into a more specific swim phase next week, I took them through a Critical Swim Speed (CSS) test on Tuesday with a 400 and a 200m Swim TT. This test looks at the relationship between the speeds of the 2 TT’s and gives a swimmer their current distance per second at threshold intensity. It’s a perfect set for this time of year for our Fluid Movements swimmers. One thing that I have noticed over the years is CSS sets generally favour swimmers with more endurance than swimmers who are naturally powerful but with less endurance (or unfit). They have the ability to hold their CSS pace over longer sets a little more easily. So when I am watching my swimmers do the set, it can give me an indication of a few things. 1. Their natural speed and endurance in the water. 2. Their current fitness and ability to hold speed (speed end) at that time. 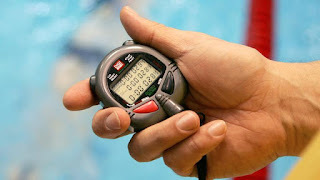 The exercise of doing CSS testing gives the swimmers a 100m split speed to aim for using the pace clock at the pool. It gives them a mark to strive for that’s based on their current form, and I find that it really motivates them to push the whole set. Can’t wait to get stuck into the next 12week block.